At Laboratory Design & Construction, we like to think of your lab’s casework systems as its skeleton. Casework provides the structure that holds all of the other working parts in proper order. We design intuitive casework systems, created to provide a smooth and easy workflow that allows you to get more done in less time. Casework systems include built-in and modular components. Modules can be designed for sitting or standing heights, bulk storage and wall cabinets. 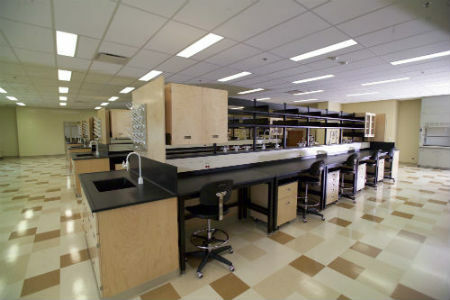 Depending on your lab’s specific requirements, casework can be constructed from a variety of materials. If you need help in determining the best materials for your lab’s casework, just let us know. We’ll work with you to ensure all of your lab’s specifications are met. Metal – BMC Metal-Arc, Inc. Stainless Steel – Custom Stainless Products, Inc.
Quality lab casework design and build services. Tell us about your project.